A record 28 UNCW staff members were nominated for the award, including WCE staff members Kerri Fowler, Melissa Newcity and Jan Siko. 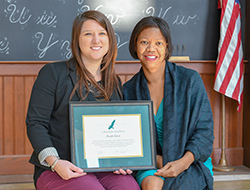 Nominees were recognized at a ceremony at UNCW’s Burney Center on November 15, and the awards were announced in a UNCW homepage story the following day. Geczi joined UNCW in August 2014 as an administrative assistant in the Watson College Dean’s Office and was promoted to her current position in July 2016. In her nomination letter, Roseboro praised Geczi’s can-do attitude and spirit. Geczi, who earned her Master of Public Education degree from UNCW in December 2017, was presenting research at a conference of the Association for Research on Nonprofit Organizations and Voluntary Action in Austin, Texas at the time of the awards ceremony. Roseboro accepted the honor on Geczi’s behalf. Melissa Newcity, administrative associate in WCE’s Office of Student Advising and Integrated Leadership (SAIL). LeAnne Smith and Allison Rankin, academic advisors in WCE’s SAIL Office, nominated Newcity for continuously connecting with peers and always seeking best practices from across the college and university.